I’ve been tagged by the amazing Sally Murphy to be part of this author blog chain. Sally really is amazing. She obviously has several clones as she is a mum of six, wife, daughter, teacher, speaker, web site manager, reviewer, story teller, PhD Candidate and author. She admits that when she does see a gap, she quickly plugs it with another project. This woman is unstoppable! She also finds time to be extremely supportive of other writers and good fun. 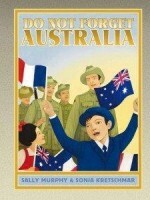 Her latest books include the very moving and inspiring book set during World War 1, Do not forget Australia. Sally also runs the very popular Aussiereviews website where she reviews as many Australian books as she can find time to read. I’m just emerging from a long period of commissioned work, so it’s a bit scary out there. Currently, I’ve got a picture book looking for a home, and I’m about to start work on either a series of sf stories, a historical or a paranomal YA. And part of me is itching to write another choose your own adventure style series. I’m waiting to see which one takes off first. I suppose my work must reflect my own self and experiences, which makes it different to other writers’ works. When I write a picture book, I like to use as few words as I can to allow plenty of room for the illustrator to weave his or her magic. Many of my books have the theme of tolerance, which I never realised until I looked back at them. I think many writers have a recurring theme, if they look for one. Maybe because I’m trying to make sense of my world? I love to write in a variety of genres, but I also love to read in a variety of genres. I have very eclectic tastes. My mind roams around the shadowy, convoluted tunnels of my brain until I have an image of a character or a situation. Or sometimes inspiration can arise from a fragment of conservation. I heard a man once proclaim, “I pride myself on my sense of smell”, and I know one day that will pop up in something. One of the best things about writing the Ranger in Danger series with Sean Willmore, was that I was given the opportunity “to make a difference”. 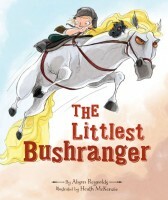 Children all around the world are reading the books and becoming aware of the role that wildlife rangers play in preserving nature. I also realised how much fun it is to write a “baddy” when each book in the series featured a different villain. I love to write in many genres so it’s a process of starting several projects at once, and seeing which one engrosses me and takes off. I spend a great deal of time working out my project in my head, and then tend to write it down very fast. I’m very disciplined when I have commissioned work and just attack it! 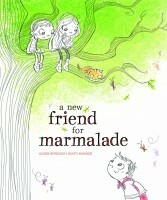 When I wrote A New Friend for Marmalade, it was like revisiting an old friend. I knew my characters, Ella, Maddy and Marmalade from A Year with Marmalade. I spent time daydreaming, that looked suspiciously like sitting on a chair drinking tea, and the new character Toby emerged who was based on my imagining of what my Labrador, Toby, would have been like if he had been a boy. Gotcha Chris! One of the unexpected pleasures of being a writer is meeting other writers who are part of your tribe. Whether you’re celebrating or commiserating, Chris Bell is excellent company. Most days you can find her burrowed in history books and websites, occasionally forgetting she’s supposed to be writing while she journeys back to life a century or two ago. 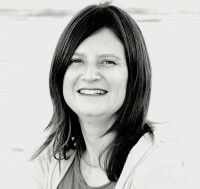 Currently she is working on YA historical novel set in convict Tasmania. She has written over thirty published books for children, including picture story, chapter and YA. Her contemporary YA novel, Jumping Through Hoops, won the CYA Published Author Prize 2011 and was longlisted in the international 2012 Mslexia Writing for Children Competition. Next month, she’s excited to be heading to Katoomba to take up a Varuna Retreat Fellowship to work on her YA novel. Tagged you, Candice! I met Australian author Candice Lemon-Scott in Qld, and discovered we had so much in common it’s ridiculous. And now she’s running one of my fave bookshops, Big B at Burleigh Heads. She has published four books for children and has a space adventure series Jake in Space (love the title) due for publication later in 2014. Her debut novel for adults Unloched received a commendation in the Victorian Premier’s Literary Awards. Candice has a Bachelor of Communication / Diploma of Arts (Professional Writing and Editing). She has a media background and writes non-fiction as well as fiction, and she’s passionate about literacy and mostly writes fast-paced stories for reluctant boy readers. Candice is a literacy champion for the Literacy Villages program and a Books in Homes role model. You can run but you can’t hide, Jaq! Jaquelyn Muller can do anything, but escape me. She writes a fabulous book, then publishes it, then markets it and ends up wheeling and dealing in China! Apart from a habit of suffering uncontrollable fits of laughter for no apparent reason and doing a rather average job of growing vegetables (an embarrassing admission for a vegetarian) (ME: Maybe they’re too scared to grow because they know you’ll gobble tem up), Jaquelyn released her first early childhood picture book, ‘I Love You 5 Lollipops’, in May 2013. Sold locally and internationally, it was included in the New Title Showcase of the Shanghai Children’s International Book Fair in November 2013. The follow up in the series titled, ‘Elizabeth Rose on Parade’ will be released in September 2014. Jaquelyn is the mother to two girls and the owner of the overindulged diva cavoodle, Millicent Olivia Muller (aka, Millie the worst best dog in the world).Collaborating in creative relationships is one of Jaquelyn’s favourite things about writing for children. Whether working with other authors, illustrators or discussing story ideas with children, she believes in the deep level of trust in handing over your creative vision and asking others to invest their time in it. Jaquelyn is an author champion for the Let’s Read national early literacy campaign and is a member of SCBWI, the ASA and CBCA Vic. Aww. Thanks for your kind words, Alison. I really enjoyed getting to know you better.I think the theme of tolerance is such an important one for kids (and adults) to consider- so I’m glad it’s the one that recurs in your work. Can’t wiat to also learn more about your three tagees. This is fun, isn’t it? Great to find out more about some of our talented Aussie authors. Inspiring!